Home > Do You Need Prayer? Someone from Altadena Baptist Church would be honored to pray for you. Through prayer we believe that we can connect the needs of our community directly to the everlasting love of God. Please note your request with as much or little detail as you desire. (You can even ask anonymously for an unspoken request.) 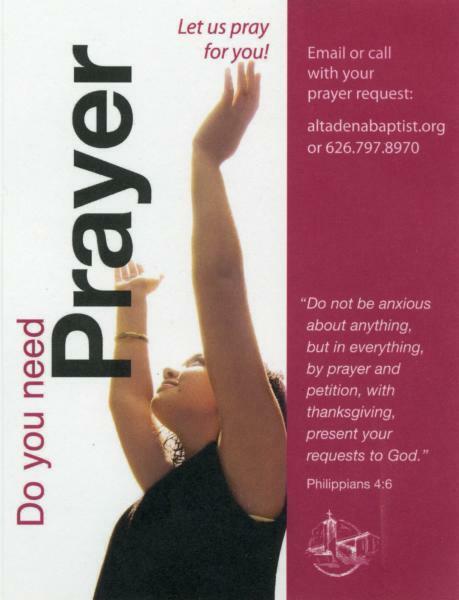 Someone from Altadena Baptist Church will take your request and pray for you this coming week. We will not print or publicize your request in our website or our publications—we will merely connect your request with someone who is willing to pray for you. Prayer and Privacy: We want to assure guests to our website that if you ask for prayer, it will not show up on this website.